He lived a long and beloved life. May angels sing thee to thy rest. DC Salutes the Bicentennial Belt Buckle! The point of collecting 25 of the 33 Bicentennial banners (remember?) was to get the free metal Superman Belt Buckle in antique silver finish. I found the belt buckle on ebay last spring. It went for about $15.00 and I was the only bidder. Yes, I paid $15.00 for it. $15.00 for a belt buckle? No, it’s not just a belt buckle, I paid $15.00 for the Superman Belt Buckle in antique silver finish offered in the DC Salutes the Bicentennial promotion! By the way, of you are looking for the buckle on ebay you have to look long and hard. You have to go through a lot of belts and buckles with the Man of Steel or come kind of “S” on it until you reach THE buckle. In March there were 528 hits when you type in “Superman Belt Buckle” on ebay. Do you see it? Middle left: there it is! They are selling the buckle! Along with a Batman and Wonder Woman buckle! All that scrambling around town looking for 25 bicentennial banners and I could have bought it for $3.35 (with shipping & handling) a year and half later!? Thanks for reading through these blogs on the DC Salutes the Bicentennial comics over the past several months. I hope you enjoyed this trip back when comics were fun! 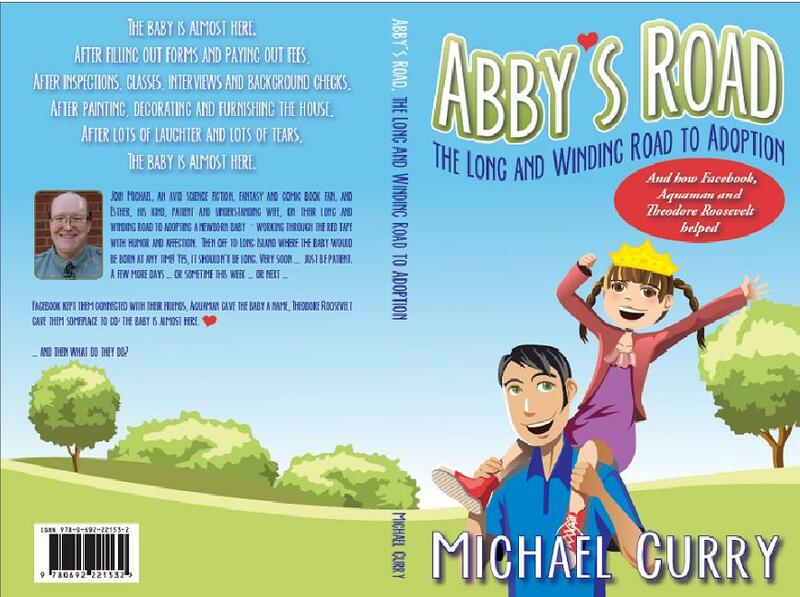 Five years ago today – One last Abby’s Road Anniversary: Abigailegalities! 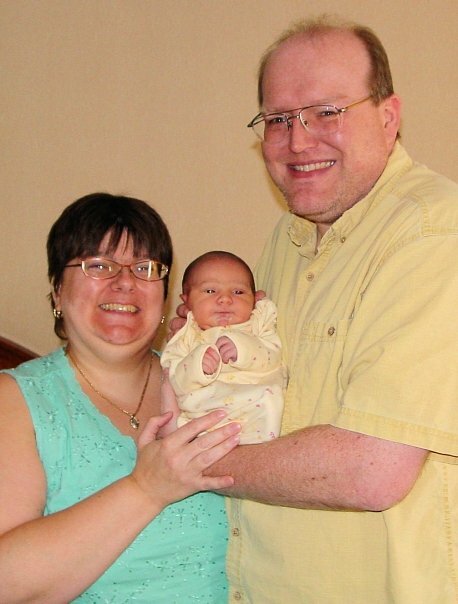 Also on June 16th, 2010 my sister gave birth to a baby girl. As with the call allowing us to go home; if I had made up that coincidence for a story, an editor would slash it out. Esther and I always celebrated June 17th as “I Love You Day”. It was halfway to Esther’s birthday and the anniversary of her first marriage. And with our anniversary, both birthdays (now three birthdays) and Christmas all in the last part of the year; we wanted something to celebrate in the summer. Now we call June 16th and 17th “Abby Day” or “Adoption Day”. 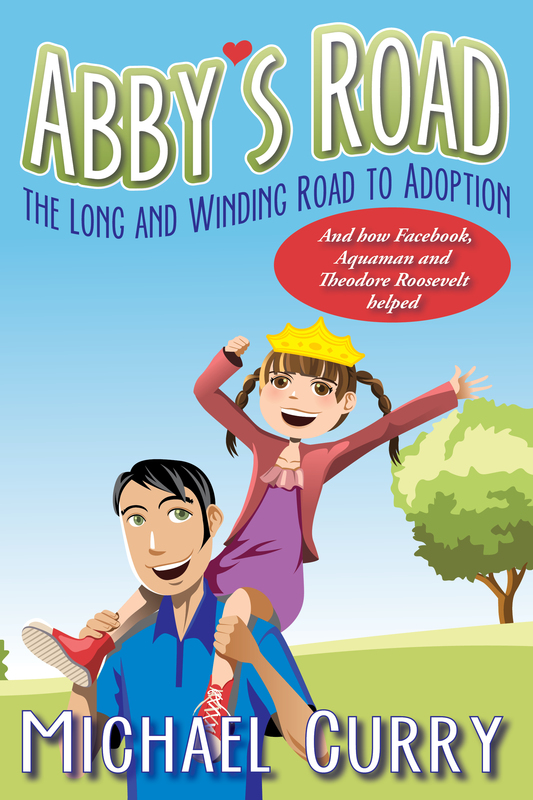 Some adoption advocates like to call it “Gotcha Day”, but that sounds like something that would trigger an Amber Alert. 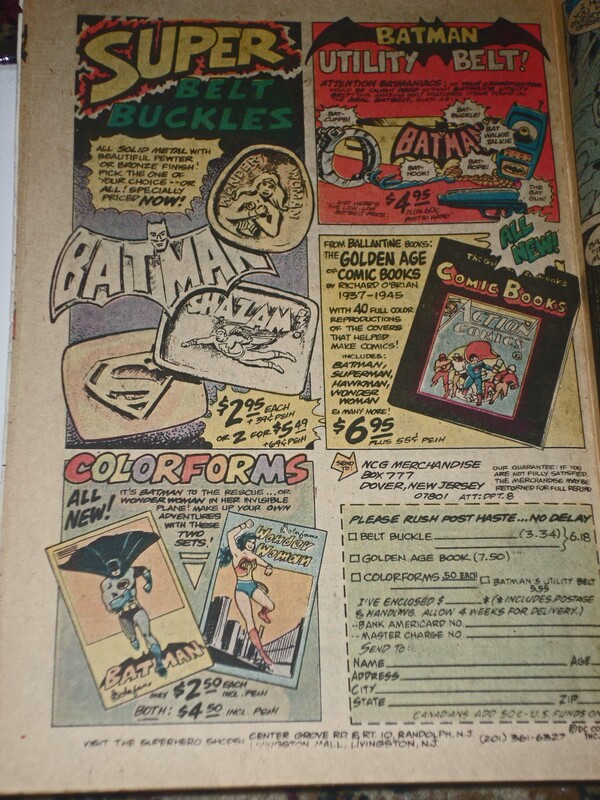 My most recent blog post – part of my series on DC Salutes the Bicentennial comics from July and August of 1976 – was about the last comic: #33 – DC Super-Stars #5 and commented about the golden age Flash strip contained therein. 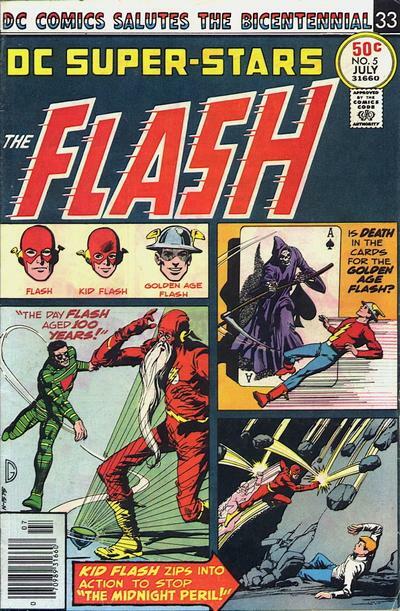 They did it again in a golden age Flash reprint in DC Super-Stars #5. 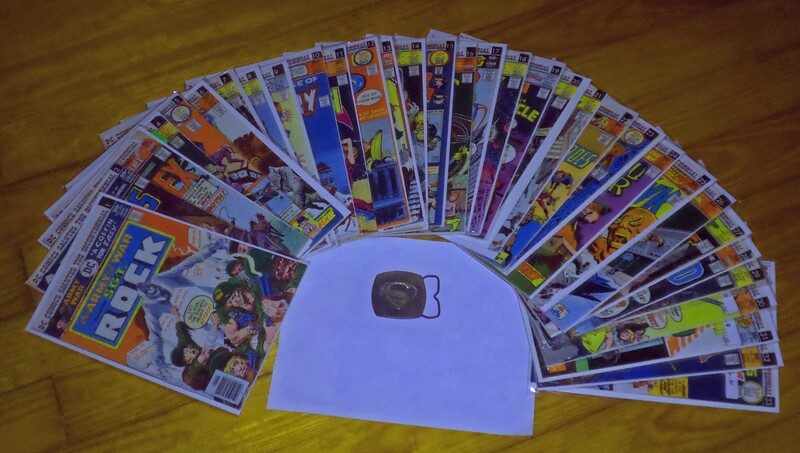 In comics from years previous it was explained that reprinting golden age stories were hard to do because of the poor reproduction technology at the time. That makes more sense and we the people would likely accept that as a more logical explanation (although still BS). As far as I can tell they only did this twice. Perhaps the third time was not the charm and boomeranged on the editor. 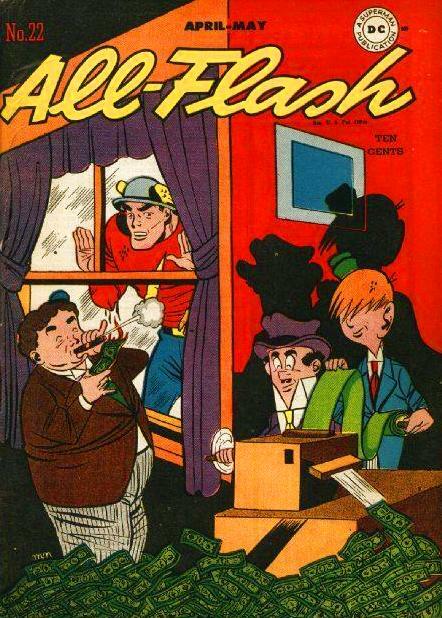 Keep in mind the publisher of National comics once drew the Golden Age Flash strip. Fun stuff! Thanks for reading! 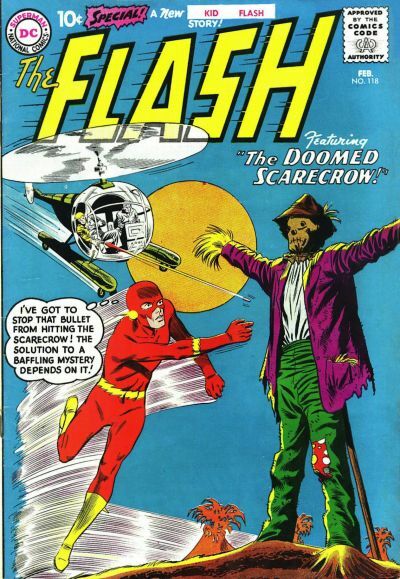 The last Bicentennial banner comic … DC Super-Stars #5, a Flash in the pan? 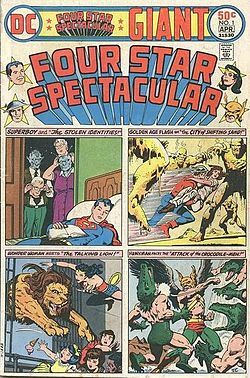 DC Super-Stars was an anthology series published from March 1976 until February 1978 lasting 18 issues. It began as a reprint series (such as this Bicentennial issue) but as of issue #12 began printing original stories. Teen Titans, Aquaman, the Legion of Super-Heroes, Zatanna, Adam Strange (these were titled DC Super-Stars of Space and also featured the Atomic Knights, Captain Comet, Space Ranger, etc.) were some of the headliners. New stories included Strange Sports Stories (heroes and villains play a baseball game. Uncle Sam umpired), Superboy (that issue was a best seller and revived an interst in a solo Superboy series), a Sgt Rock/Unknown Solder team-up, a Phantom Stranger/Deadman Halloween team-up, the debut of the Star Hunters (an excellent forgotten comic book series) and origin issues featuring various heroes and villains (including the debut of the Huntress in #17). This Bicentennial issue features the Flash. 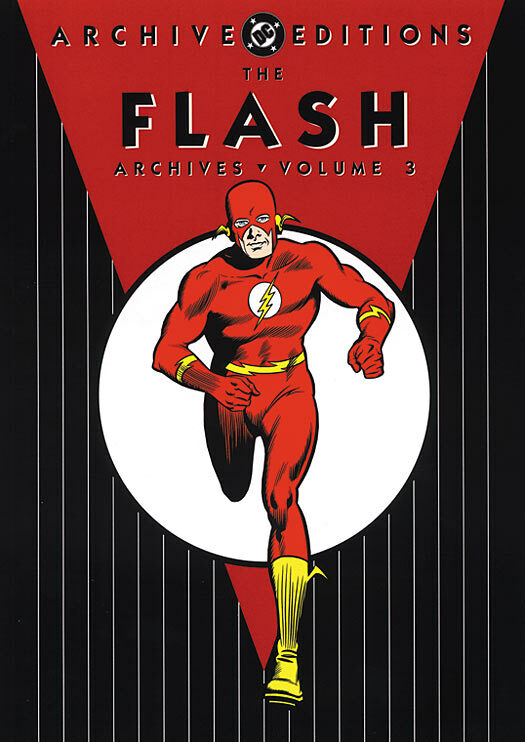 “The Day Flash Aged 100 Years”, Gardner Fox ( w ), Carmine Infantino (a), Joe Giella (i), Julius Schwartz (original editor). Scientists at Centralia University have created an aging formula. 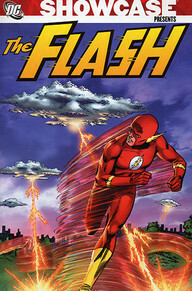 The Top steals the vial containing the liquid, intent on using it on Flash, It will age the Scarlet Speedster and force him to retire as old athletes do. The Top raids the Flash museum and is stopped by the Sultan of Speed. Top hurls a grenade at his adversary. When it goes off, Flash ages 100 years! He has a long beard and his costume droops on him. Top easily beats Flash with a punch. But it is all a ruse. Flash vibrated through the toxins and disguised himself at superspeed to trick the Top! But no matter how many times he encounters (and is beaten by) the Top, Flash still cannot find the vial of the remaining aging formula. The Top’s vibrational weaponry combined with the aging formula now causes Flash to evolve as well as age (how can this be when it was a ruse? Quiet…). His head grows as his mind evolves! He attacks Top with his mental prowess. Top escapes – and realizes that with the formula and his tops he can evolve himself into Super-Top! He takes the formula from a hollow leg of a table. Flash snatches it away before Top can use it. 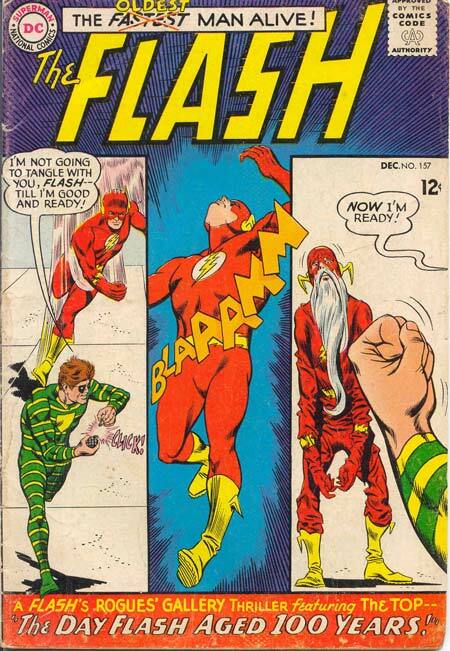 Flash’s evolving into a higher being was a ruse (but … I said quiet!)! 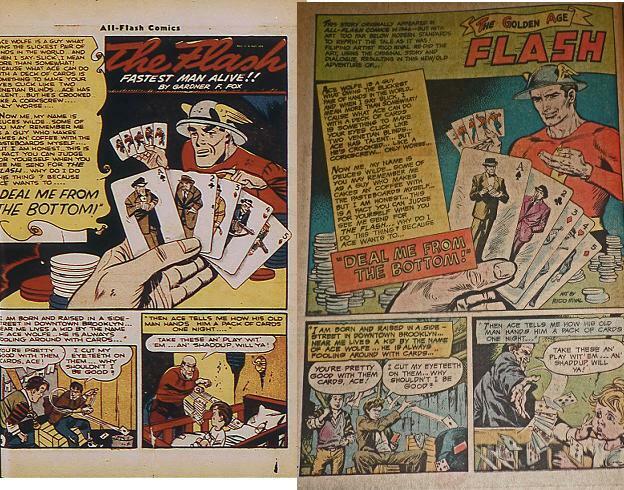 Magnets and superspeed helped create the illusion of the Future Flash! Flash thanks museum guide Dexter Miles for his acting and make-up expertise in capturing the Top! “The Midnight Peril”, John Broome ( w ), Carmine Infantino (a), Joe Giella (i), Julius Schwartz (original editor). To join a high school fraternity, Wally West and Peter Willard must stay in a haunted house until midnight. Discussing Kid Flash to pass the time (Peter: “Do you really think he can do all that super speed stuff?”) they see two figures in ghostly garb who demand they leave! The boys bolt from the house. Thile Peter keeps running, Wally dons his Kid Flash garb to investigate. Sure enough, the ghosts are merely two crooks scaring the kids away from their hideout! Kid Flash puts on the ghostly disguise (a sheet with holes in it) and with his superspeed haunts the crooks with dozens of “real” ghosts! The crooks flee with the “ghosts” chasing them. 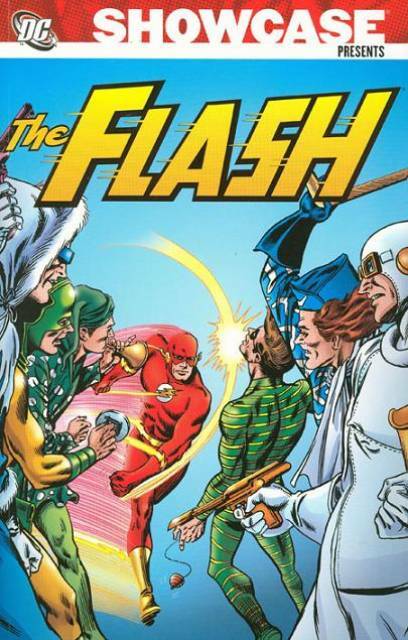 Kid Flash herds the crooks into police headquarters where they happily surrender. Meanwhile, a panicked Peter catches his foot between rocks at the bottom of a tall rocky hill. Lightning from a summer storm strikes the hill and causes an avalanche. Kid Flash deflects the stones and rescues Peter. Peter goes back to the “haunted” house where Wally tells him Kid Flash appeared and sent the “ghosts” to police HQ. The boys are welcomed into the fraternity, having passed their test (although technically they DID leave the house before the deadline …). A one-page feature describes the history of measuring the speed of light. Even I understood it! 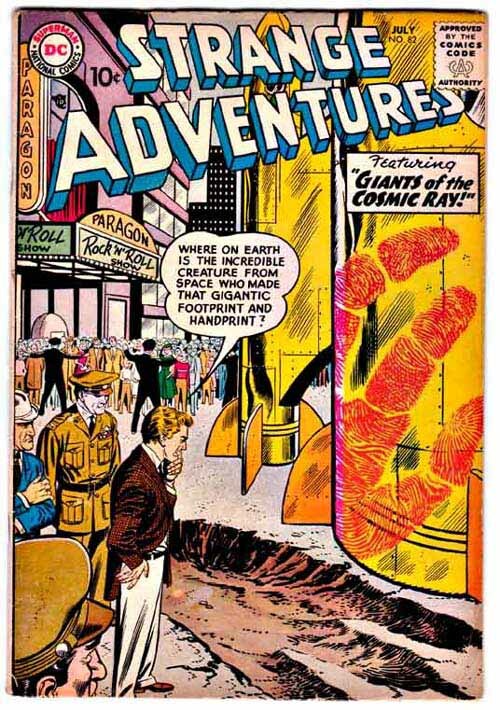 and also reprinted in Strange Adventures #82 (July 1957). 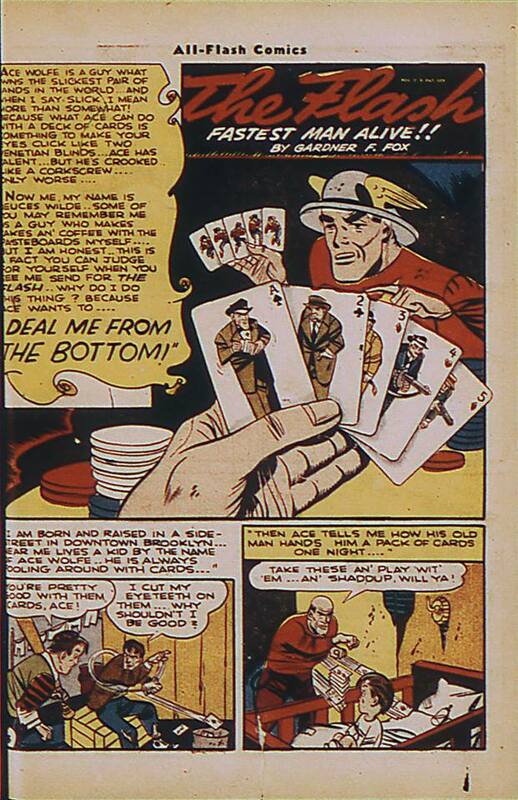 Nearly a half-century (actually 44 years) before the X-Men’s Gambit, Ace Wolfe could also throw playing cards with deadly accuracy. After his crimes in the west coast made things too hot for him, he returned to Keystone City and met up with his childhood friend, professional gambler Deuces Wild. Deuces was an “honest” gambler and didn’t want any part of Ace’s crimes, but Ace left him no choice. Deuces sent a secret message to Joan Williams about Ace’s upcoming crime. Joan, you see, is rumored to have an “in” with the Flash (she is unknowingly the girlfriend of Jay “Flash” Garrick). Flash stops Ace from his robbery, but Ace and gang manage to get away. Ace suspects Deuce of finkery and keeps him captive for their next crime. Fortunately Jay discovers Ace’s next move while buying a costume for a masked ball. Seems the saleslady said there was a big demand for mailman uniforms for the big postal workers ball. Why would postal workers need mailman uniforms? 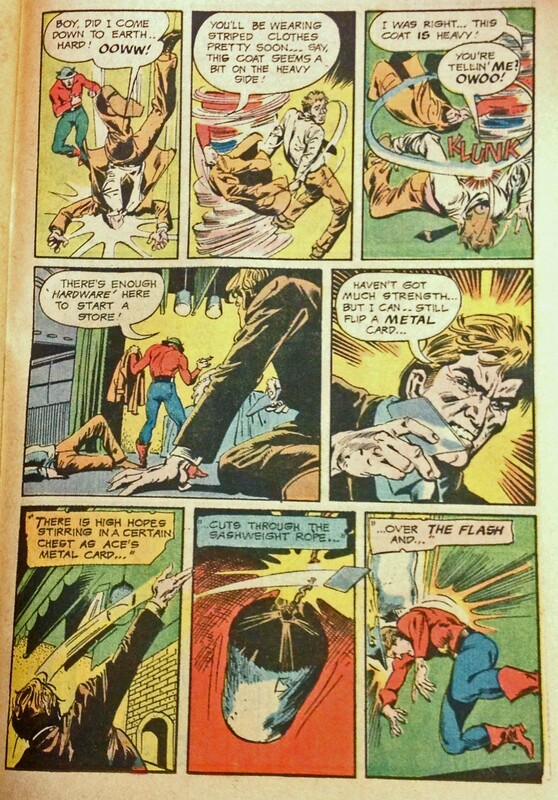 Sure enough, Flash stops Ace from robbing the party-goers and sends Ace to prison after rescuing Deuces. 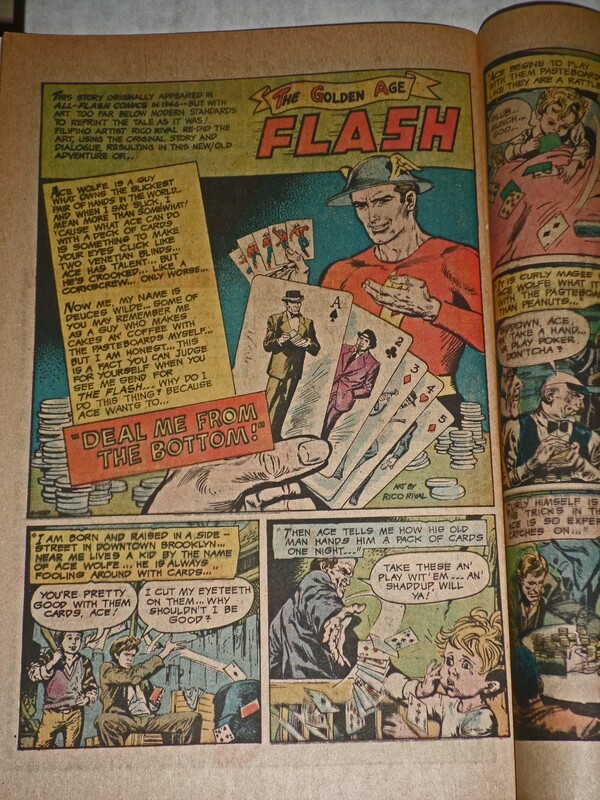 This story is reprinted – kind of – from All-Flash #22 (May 1946). Let’s not put the onus on Rico Rival – who did a great art job on a thankless task. It wasn’t his fault, folks, give him some credit here… But still, it kind of smacks of “Star Wars Special Edition” – the original was probably just fine. 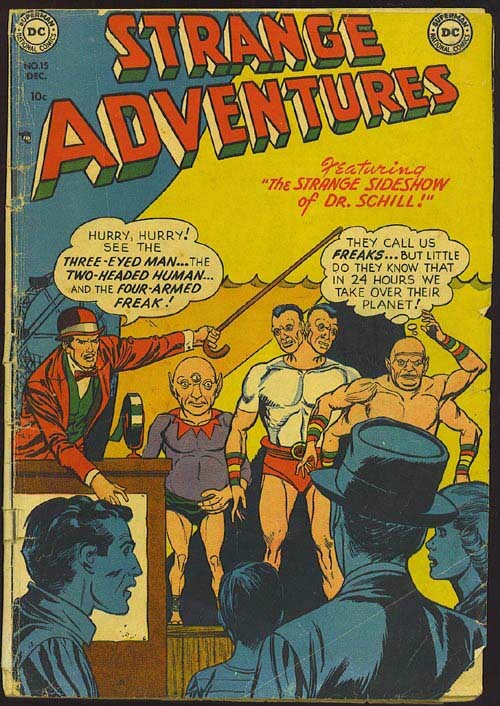 Keep in mind the publisher of National comics once drew the Golden Age Flash strip. John Broome, Gardner Fox, Whitney Ellsworth, Carmine Infantino, Julius Schwartz, Joe Giella, Mort Drucker, Sheldon Meyers, Ted Udall … it’s great seeing these names in a comic book, isn’t it? Rico Rival, too!